The sunsets at Kishti Villa on Blackgarden are truly incomparable. In fact, the sunset-obsessed owner of the villa gave his real estate agent one perogative while househunting: the home has to face the west. With stunning panoramic views from the interior and exterior, the villa achieves its goal! Every bedroom, balcony, shower, and tub looks out over the water, so you’ll never miss the sun sinking into the horizon at the end of each day. Modern, spacious with panoramic views of the ocean! Kishti Villa on Blackgarden is named after the Urdu word for boat, which is often used in poetry and verse to reflect life, love, and God. With incomparable sunset views, a massive infinity pool, and a waterfront location, the name certainly fits. Kishti was designed by renowned international designer Cecconi Simone with architecture by Frank Hamilton, and is one of the most modern villas on the island. The villa sits near the water on a volcanic rock shoreline, with a multileveled terrace that faces the sea. 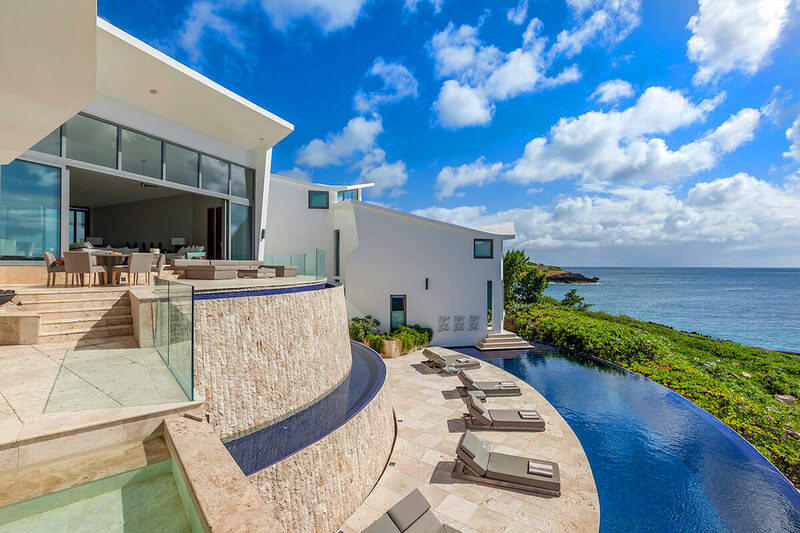 A large infinity pool wraps around the home and borders the shoreline, with a curved deck mirroring it. Lay on a lounger and take in the ocean views, or hide out in the grotto with a hot tub. There’s a giant shaded bed that was made for napping, and a sound system and bar that are perfect for partying all night. On the upper level of the terrace, a BBQ grill, sectional, and al fresco dining provide the perfect spot to enjoy an evening snack as the sun sets. The living room’s ocean-facing wall opens completely, so there’s no division between the interior and exterior. The living room has chic, magazine-worthy furnishings and lighting, with a ton of windows to make the most of the tropical sunshine. The dining table seats 8, and two can sit at the breakfast nook in the kitchen. The kitchen’s sleek cabinetry, wine cooler, French press, and top-of-the-line appliances will please any cook. The Master Suite has a king-sized bed, TV, office area, and ensuite bathroom. Floor-to-ceiling windows maximize the ocean view. The ensuite bathroom has an outdoor shower and the private terrace has a hot tub and sitting area. Each of the three other bedrooms have a king-sized bed, ensuite bathroom, TV, fridge, sitting area, and terrace, so guests have maximum privacy and equal amenities. Each suite also has in-room coffee service, for easy mornings. The fifth bedroom has two twin beds and an ensuite bathroom, perfect for older children, a nanny, or security. Each of the ensuite bathrooms are spacious and sleek, with large bath tubs. There’s also a fitness/recreation room with a treadmill, stationary bike, TV, and ocean view. Kishti guests have signing privileges at CuisinArt Resort and Spa, except during the Holiday Season. The villa is only 3 miles from shops, restaurants, and the hospital; and 7 miles to the beach, golf course, and tennis courts. Access to a small cove beach called Black Garden Bay Beach. A taxi is arranged to meet guests at the port of entry (airport or Blowing Point ferry dock). Once at the villa, guest are greeted by the villa staff, given a tour of the villa. The staff is available to answer any questions you may have. Welcome ages 5 and over. Car rental, private chef, butler, server (during summer season), grocery and beverage shopping (pre-arrival and during your stay), liquor and wine delivery, nanny service, baby equipment, spa services, yoga and personal training, photography, and private airport transfer/car service can be arranged for an additional fee.